Follow the warming money | Watts Up With That? This might make you mad. That’s even more reason to read about it. $1.9 million in environmental justice grants 10th May 2010 The U.S. Environmental Protection Agency (EPA) has awarded $1.9 million in environmental justice grants to 76 non-profit organizations and local governments working on environmental justice issues nationwide. The grant program supports Administrator Lisa P. Jackson’s priority to expand the conversation on environmentalism and work for environmental justice. And it isn’t just in the USA, the EPA is giving US taxpayer money to Brazilian programs. Think that’s bad? They are giving money to China too, as if the Chinese need our help. To develop a publication, the “Atlas of GHG Emission and Energy Potential by Waste Destination in Brazil.” This will provide up-to-date information on waste management in the country, the types of final waste disposal in each geographic area broken down by state, waste management as a renewable energy resource for Brazil, the potential for GHG emissions reductions, and finally the viable end-use options to be applied in the sector. The China Association of Rural Energy Industry will help 100,000 Chinese adopt cleaner technologies that improve health while protecting the environment (reducing deforestation and greenhouse gas emissions). So…my tax dollars (and I suspect almost all of Anthony’s readers are taxpayers as well) are going to ‘help’ one in 11,000 Chinese. *This* will save us all… BTW, many here are aware of this, but ‘environmental justice’ = Agenda 21. That story doesn’t turn out well for we little folk. Bet i know who Lisa P. Jackson will be voting for. Could November 6 be the most important day this century? Why the outrage? The amounts are peanuts and clean stoves a good idea. eh…millions?…must mean BILLIONS? And there are quite a few …non-US recipients. Isn’t this a scandal of major proportions? Or a joke? I would like some “environmental justice” here in the U.S. – for humanity, that is. Getting a little sick of having to think of poor “Mother Earth” when I’m trying to stay warm/cool, drive to work, go to the store, etc. Environmental Justice — That’s Maurice Strong’s (slight) adjustment of “social justice.” But it’s all the same: far Left Progressive Collectivism. Grrr it makes me so mad. That money could have bought 1.1875 cruise missiles instead. How the heck is all this going to stop? Will it require a revolution? It seems that or we all sit back and allow the end of civilization. I can’t see these people coming to their senses, nor governments trying to stop them, they are so suckered in by this. While people believe it, governments will give backing “just in case there’s something in it” and to be seen to be doing something and win votes. I know vast numbers of people are waking up – and that’s a joy to see – but when enough wake up, how will governments know without the rioting mobs at the gates? And even then, what do we get but anarchy? Do we have to go down that road? 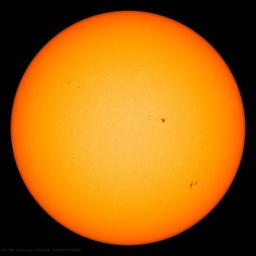 Or will the arrival of the next ice age be the thing to put an end to it? What a horrible thing to have to hope for, a natural disaster of global proportions to come soon in order to stop this destruction perpetrated by fear of a man-made one. God, I feel sick by all this. The problem is the examples quoted here are just the tip of the iceberg; the waste of money spent on the whim projects of the Global Warming Industry is truly staggering. Unfortunately, this sort of thing is so common that it has moved from the surreal to the predictable.. So we are borrowing money from China so we can give it back to them in grants? Couldn’t they fund their own projects with the enormous amount of interest we pay them on the debt we already owe them? Hmmm. I seem to remember that many of you were so incredibly, incredibly concerned about how the poor people of the world will be affected by not having access to cheap energy. Now coal is cheap of course but in China it brings tears to your eyes. The sulphuric acid aerosols are trying to eat yours eyes out. So maybe a few measely dollars donated to the poverty stricken Chinese is something you shouldnt be complaining about. That’s 100,000 out of a population of c 1,317 million. That’s really going to cut CO2 emissions! Your kidding right? You’re angry at a grants program that is “designed to help communities understand and address environmental challenges and create self-sustaining, community-based partnerships focused on improving human health and the environment at the local level”? And you call it “warming money”? 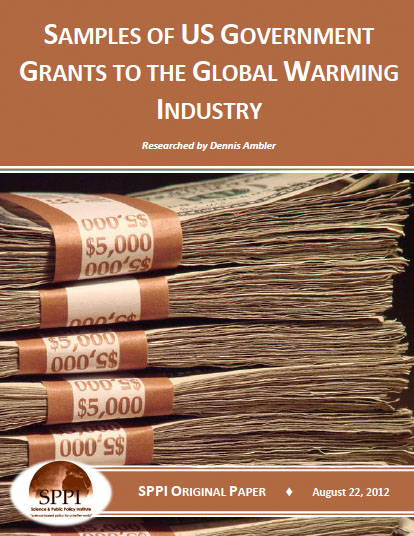 Such a grants program would make sense even without the issue of global warming. … I consider myself “green” in many ways, and I promote the idea of energy savings and alternate energy generation. I’ve put a 10KW solar array on my home, plus a 125 KW solar array on one of our local schools when I was a school trustee. I’ve retrofitted my home with CFL’s and better insulation, as well as installed timer switches on many of our most commonly used lights. I also drive an electric car for my daily around town routine. I encourage others to do the same when it comes to efficient use of energy and energy conservation. What have you against the funding of a project that “addresses lead poisoning and asthma in low-income Boston neighborhoods” or “investigates hazardous substances in community water sources.”? (see FY 2011 grant recipients). Aye, The Global Warming Industry. People with a vested interest in deceiving the public. Our politicians need to be better stewards of the public purse and challenge the pseudoscience advice they’re getting. This is white-collar corruption. However short the money is there’ll always be a politian who can find ways to spend it. “They are giving money to China too, as if the Chinese need our help. Maybe the Chinese figure it’s the best way to make sure they get some of their money back. And speaking of sustainability… (OK, we weren’t exactly) …there is a limit to OPM (Other Peoples Money). Eventually it runs out. Throughout China, cylindrical briquettes, called mei (coal 煤), are used in purpose-built cookers. These are simple, ceramic vessels with metal exteriors. Two types are made: the single, or triple briquette type, the latter holding the briquettes together side by side. These cookers can accommodate a double stack of cylinders. A small fire of tinder is started, upon which the cylinder(s) is placed. When a cylinder is spent, another cylinder is placed on top using special tongs, with the one below igniting it. Swapping spent cylinders for fresh ones, and retaining a still-glowing spent cylinder, the fire can be maintained. Each cylinder lasts for over an hour. These cookers are used to cook, or simmer, pots of tea eggs, soups, stews, etc. The cylinders are delivered, usually by cart, to businesses, and are very inexpensive. As pictured, they have numerous axial through holes for ventilation that improve efficiency. There are several types of biomass briquettes made worldwide. Depending on technique and materials, the result can be dry and easily stored for long periods, much like the ubiquitous “charcoal” briquettes for the BBQ, and produce very little smoke. Of course, being biomass they are “carbon neutral”. And producing briquettes creates jobs. So once again, follow the money. Kyoto, CDM, carbon credits, numerous financial incentives given to “developing nations” to do what can be both profitable and beneficial on its own merits. One group promoting biomass briquette production is The Legacy Foundation, a very bland name. Wikipedia doesn’t even have an entry. Legacy Foundation provides training, technology and media services for biomass fuel briquette production, environmental conservation and income generation throughout the world. The Mission of the Legacy Foundation is to promote sustainable human development and preserve our environment through the integration of technology innovation, media, and management. The Legacy Foundation has ongoing partnerships with individuals, groups and institutions in over 30 nations world wide. Want to review their work, see and evaluate the technology they supply to the needy worldwide? Head to their Products page and cough up $25 to $45 for a construction manual for only one specific model of press, then again for its user manual, and for the briquette making manual, and the briquette theory manual… Package deals available. You might also want the Briquette Marketing Manual for your fledgling third-world business that you have just invested 1-3 years of gross income into researching. And that’s not hardcopy, only a PDF download. Yup, just a download, bring your own computer, broadband, and printer. But hey, they use PayPal! We need your help. The charcoal trade inside our park forests must be eradicated and this requires the funding of several anti-charcoal operations needed soon. The illegal charcoal business is one of the greatest issues Virunga faces, largely kept in place by FDLR Rwandan militia, and directly connected to the protection of the mountain gorillas. Not only is precious forest and habitat destroyed to make charcoal, but past events have shown that both gorillas and rangers can get caught in the crossfire of a battle for this fuel source. At the end of 2009, a huge push took place to remove the charcoal business from the forests of southern Virunga. It was largely successful, but not permanent. Etc. Stop charcoal production, switch to biomass briquettes, save endangered species like mountain gorillas. Best of luck with the project.Where and for what is the charcoal being produced?Does any of the charcoal end up in European super markets as barbaque fuel or are the European supermarkets getting better at sourcing sustainable charcoal? Could that charcoal possibly be used by the desperately poor local people of that impoverished war-torn country? Of course not, European businesses are killing mountain gorillas to sell BBQ briquettes at supermarkets! Doesn’t make me mad. America is a welfare state. If they’re not wasting money on this, then it’s something else. It’s all the same to me. My goodness, what a waste. Please, US citizens, vote them out. Once again bring freedom back to the world. It’s bribe money to get the Brazilians to save some biofuel for the U.S. rather than selling all their surplus to China. Good grief, does their idiocy know no bounds? Reading this you would think that governments and their agencies are obsessed with global warming and its impact on the environment (perhaps Obama is). However in reality governments appear to be more concerned about the high demand and high price for oil and its effect on economies. Tapping into strategic reserves is being proposed to lessen the impact on gasoline prices to hard pressed motorists. In spite of the global economic downturn oil demand and consumption appear to be at an all time high. Global warmists therefore who would stop fossil fuel consumption or combustion at a stroke appear to be inhabiting a deranged parallel universe. Anger? Nope. Numbness. This is beyond stupid. It has always been about money, glory and power. Opportunists saw a great new bubble to get their investments into and make a killing. Calamatologists saw undeserved Nobels and fading glory and politicians saw control over their citizens. When the CAGW scam is over we need justice. Never (?) in the history of mankind have so many been previously fooled by so few but it’s turning. Sad that teenagers are too lazy to educate themselves and accept what they are spoon fed without question. China is the largest emerging economy and the point of manufacture for all this ‘new clean’ technology. US borrows from China and returns lots of interest already. With this scheme, Americans will buy cookstoves from the Chinese, then give them back. In short, they don’t need our help, they already own clean stoves, this is simply a play for cash. Ali I am in full agreement with you. The money would have been going to some average Joe’ paycheck to make his mortgage, buy food or pay for the over priced electicity we have foisted on ourselves. Again I concur let’s keep it in America. Romney has already made the statement that when he becomes President that since 42 cents of every dollar we spend is borrowed from China, that anything that does not justify borrowing money from China will be cut. The example he used was public broadcasting. I hope that this BS is also on the table. Oh and Ali, I hope he cuts the military as well. We are living in a dystopia, and most can’t even see it. Remember, in 1984, Brave New World, etc. it is not the majority who recognize the horror of the dystopia. It is a few individuals. Um not really, the money we pay them in debt service is used to pay for their military buildup. There’s nothing left over for their environmental programs. They definitely need our help. Environmental justice means moving factories out of the working-class neighborhoods where the people who need factory jobs live. In an odd backwards way, giving part of this money to China might actually help America by a microsmidgen. If China uses the money for its intended purpose, Chinese factories will find it marginally harder to operate, which might give a very slight comparative advantage to American factories. If EPA figures this out, it will cancel the grants to China, since its sole raison d’etre is to assassinate America and advance China. I heard that comment a lot as a credit counselor: It’s only a three dollar latte. We only go to the movies a couple of times a month. We eat out because it’s more convenient–we HAVE to eat, don’t we? All these people had the same thing in common: They were heading for or landing on bankruptcy. That $3 latte twice a day was $120 a month. Movies, another $60. And eating out more than doubled food costs. You statement applies to the billions more in grants handed out every day, as well as these mentioned in the article. Americans are very, very bad with economics and that is not something we should be proud of. It’s dangerous. Even our “responsible” leaders are afraid to cut most funds for fear the looters and moochers will prevent them from being re-elected (which is probably true). So the decent into bankruptcy just goes at a slower rate. It does not stop. @Garrett: There is a huge difference between this grant stuff and homeowners and wage earners making their homes more energy efficient. The money the wage earner uses is his own and this is his choice. The grants are money wrenched from the wage earners and used for the government’s pet projects. Consider how you would feel if Ms. Lisa declared your home a wildlife preserve, led tours, made you plant what she wanted the visitors to see, keep wildlife protected including those fuzzy little rodents, etc. Still sound like a good idea? Didn’t think so. These ideas never sound as good when it’s your back yard they’re using and you actually have to live with personally. It has always been about following the money. Look at where your tax dollars are being spent. If you are not happy, then it is time to change the leader in this country. Last time I voted for Obama. Not this time. This make so sick. Absolutely crazy I visited the site and here’s the first line “The U.S. Environmental Protection Agency (EPA) has awarded $1.9 million in environmental justice grants to 76 non-profit organizations” . Why is the EPA allowed to give grant money away outside the country? Shouldn’t such money be considered “foreign aid” and administered by the State Department? Why not use the money instead and use it to help Americans? After all, the money was collected by the US government from Americans on the promise to benefit Americans. Wasn’t it the Founding Fathers of America that said that all governments over time become the enemies of The People they govern? That governments ultimately act to help themselves, in the name of helping the people. What to put America back to work? Move the EPA to China. Vote the bums out? Can we not see that our public dialogue is limited to Team A and Team B? Would you like the red or blue kool-aid? The web does facilitate slipping some things by the gatekeepers (e.g. wuwt; wikileaks; antiwar.com) but the bulk of voters are not ready to evaluate information for themselves and break out of the false dichotomies. I fear that even as fewer and fewer get their info from newspaper and TV news (i.e., the older generation dies), the diseducaters will meet them at their preferred medium and the majority will always be functionally illiterate, unable to see that they are being herded. Worse, those capable of critical evaluation are still products of a fractured society and culture, unable to achieve dialogue for an ever-increasing lack of commonly shared beliefs. A few dollars to China and Brazil is laughably small change–a distraction Does no one remember the greatest theft in history–the corporatist team A and corporatist team B approved bailouts? Everything produced in America is heavily taxed and regulated. By moving factories offshore, companies can largely escape these costs and bring the goods into America at much lower cost. Over time, this has killed manufacturing, employment, property prices and tax revenues in the US. Would if not make much more sense to eliminate taxes and regulations on workers and production, and instead apply the taxes and regulations to goods and sales? In this fashion, anything sold in American would be subject to the exact same taxes and regulations, regardless of where it was manufactured, and there would be no advantage in moving manufacturing offshore. 80 years ago, before the “global economy”, before “free trade”, Congress decided the income tax was a better tax than the sales tax. Since that time the rules have changed, but Congress has not recognized the reality. By taxing production, the US is forcing companies to move to China and India to remain competitive in the face of a global economy and free trade. However, if Congress was to remove the taxes on production and replace them with taxes on sales, then all products, regardless of place of origin would be equal. By eliminating taxes on production, US manufacturing costs would be substantially lower, resulting in significant costs savings to US manufacturing. Since the US has large economies of scale, this would immediately change the incentive for companies to re-locate offshore. Thousands of companies would return to the US to reduce transportation costs, resulting in an economic boom in the US. With this boom would come jobs, a reduced tax deficit, and increased property prices. This would restore confidence to the US economy and the banking system, and end the up-coming foreign debt crisis with China. The imbalance in trade with China cannot end well otherwise. The British Opium Wars provide a historical perspective on what is to come if current trends are allowed to continue. environmental justice was coined to help redistribute wealth. Absolutely another excellent reason the current administration and all its appointees must be thrown out this November! To understand the effects of taxes on production, consider the income tax. Most people pay a marginal income tax of roughly 40-50%. The first dollar in income is rarely taxed, but the last dollar you earn each year is highly taxed. So, if prices go up (inflation) 4% a year, it would be normal to ask for a 4% raise in wages to meet the increased costs. However, this 4% raise would be taxed at the marginal rate, meaning that the government would take almost half of your raise in taxes, leaving you with an increase of slightly more than 2%. So, over a period of 20 years as costs double due to inflation, your wages will double, but almost half of this will go to taxes. Over a period of 40 years, when costs double again, another half of your increased salary will go to taxes. What this means that over a period of 40 years, one full salary will be lost to taxes. A second salary will be required to make ends meet. Which is exactly what has happened. In the 1960’s most families were able to get by with one working parent. In the 2000’s most families required two working parents to get by. Where will the third working parent come from in 20 years, when income taxes and inflation erode another full salary from the two working parents? We are half way there now. Perhaps they should spend a few of their “measely” dollars on that stuff….. and we can spend our measely dollars on people in our own country. How is it that all of you CAGW “disciples” understand that ……. oil and gas are finite resourses and will not last forever …….. and yet seem to feel that US tax dollars are an infinite resource that can be spent without regard to anything. You both know eff all about China and how money sent there gets used. Just STFU on things you know nothing about, which applies to anything viewed with commonsense and anything honest or truthful related to AGW related matters. Vote the bums out? Can we not see that our public dialogue is limited to Team A and Team B? Proposition X – all ballots shall contain the option “None of the Above”. If “None of the Above” is the majority vote in any election, a run-off election shall be held, and the candidates on the first ballot shall be barred from seeking office, having already been rejected by the voters. In this fashion, the electorate has a choice. Otherwise, the parties in power control the choice by limiting the options presented to the voters. Team A: well meaning incompetent. Team B: results oriented crook. In both cases the voter would be better served by “none of the above”. At least they would still have their tax money in their own pockets. In this country, we have a constitution that theoretically places limits on what our government can do and I can’t find anywhere this is authorized under the powers granted to the government. We also have the right to petition our government and seek redress, so any citizen has the right to complain. Also, when the government does something, it’s no longer charity. Don’t fret! This money will enrich some Chinese corrupt official. He will embezzle these funds and flee to a life in the good ol USA. Now coal is cheap of course but in China it brings tears to your eyes. It is burning dung which is the most common fuel source in the 3rd world that brings tears to your eyes. Dung is all that is left after the trees have been burned. Coal is the fuel that lifted the developed world out of poverty, and allowed us to replant our forests instead of burning them as firewood. Coal is also the main competition for oil, and it is what prevents big oil from raising prices even higher. Air pollution from coal kills the old. Poverty kills the young, before they get a chance to grow old. Thus, the affluent fear coal, while the poor welcome it. From the point of view of the 3rd world coal is the most convenient power source, because it requires no special handling, not special containers, no pipelines or specialized infrastructure. You can haul coal in trucks. You can dig coal with construction equipment. Until WWII and even later, coal was the energy source of choice to heat homes even in the first world. Many older homes and office buildings still have remnants of the coal bins and furnaces that once heated them. If coal is so bad, why were people not dropping in the streets by the thousands back in the day? How did our forefather’s survive the coal trains of death? Why did they switch to oil only after it became more convenient? This didn’t stop Obama from raising mileage standards on cars. Question: since it is traffic jams and stop and go driving that is the biggest waste of fuel, why doesn’t Obama simply outlaw traffic jams? Mexico solved the traffic jam years ago. When stuck in traffic inch ahead until your bumper touches the car ahead of you.. Then lean on the horn and at the same time stand on the gas pedal. With everyone in line doing this traffic moves quickly without delay, saving billions of dollars each year in foreign oil imports. One of the best ways to clean up the environment in poor countries is to provide small business loans for local cottage industries and then let them go about their business in creating that industry. Improving the earned cash flow of individuals by making them repay their low-interest loan does more to clean up their environment than welfare in the form of benevolent grants ever could. Grants need to be externally refilled and if stopped altogether, tend to result in the degradation of what they tried to create. Loans have at least a potential internal refilling source and when stopped have a far greater chance of resulting in what they helped create be successful on its own. Stop the free stuff and instead build on the strength of the individual entreprenerial capacity of the human species. At the same time as the USA is giving money away the EU is funding Climate Programmes in the Sahara. A large fraction of that money will have been borrowed from the Chinese for which we pay them interest to do so. Therefore, we are borrowing money to give it away to them and paying them on top of that to take it. @ferdberple Your statements about marginal tax rates were interesting, considering virtually no one pays the actual marginal rate. The marginal rate was as high as 91% in the past, with multiple tax brackets along the way. Do you really think people paid 91% of their income to the government? The effective tax rate is what matters–and it’s often a negative number for the bottom income levels. I like the idea–not sure how we’ll get it into practice. Might also have the undesirable effect of keeping the incumbents in office until an election actually elects someone. I wonder how much filters back as campaign contributions? IMO, congress recognizes the reality and sells changes to the tax code to fund campaigns. It’s the primary reason the federal government is so broken. The tax code needs to make sense again. History shows that no matter high how the marginal tax rates, the average tax revenue as percentage of GDP hovers at around 18% (http://www.deptofnumbers.com/blog/2010/08/tax-revenue-as-a-fraction-of-gdp/). Higher rates do not result in higher revenues because people change their behavior according to the tax code. When marginal tax rates are high, people put their money in unproductive (and legal) tax shelters, such as low-yield municipal bonds. When marginal rates are lower, people invest more productively, that is, they put their money to work instead of parking somewhere. Lower marginal tax rates promote economic growth and more tax revenues. Depends on what you mean by government. No government is better than a bad fickle one, or a tyrannical one, or a Marxist one etc. EPA= Lavish with taxpayer Cash, economical with the Truth. Isn’t it strange how countries deep in debt can afford to give money away. Holy cow some of these reponses really scare me. China does not need or deserve a red cent from the USA. 1.9 million could have bought high effeciency ac units for right here in the USA, could have bought high effeciency toilets for low income right here in the USA. If the Chinese want to pollute themselves to death then that is their right. Fix the USA before you try to fix other countries. We have to stop ALL out of country cash outflows, untill we get OUR budget in order. It will be tough people will be mad as hell but we are moving in an unsustainable course which will at some point becom catastrophic. Unfortunately it will be sooner rather than later. Well Garrett, I’m all in favor of “communies” ….”at the local level”… understanding and addressing environmental challenges “at the local level”. It used to always be that way. But Clause 1 of Article 1 Section 8, of the US Constitution ONLY authorizes the Congress to lay and collect taxes;….to pay the national debts…..to provide for the common defence… and the general welfare……..OF THE UNITED STATES. The United States is that Washington DC third party to the Constitutional contract, besides “We, the people” , and the “several States” of the Union. (all 57 of them). We don’t get taxed for the benefit of Brazil, or communist red China; only our debt obligations, and defending the Union, and its wellbeing. The (sovereign) States can take care of their State issues (as provided for in their State Constitutions), and local communities as their charters permit; and “we the people” can take care of ourselves. The other 16 or 17 clauses authorize Congress to do other things; but NOT to tax the people to pay for them. Nowhere does it charge the federal government with studying climate data. Obama and his administration have brought us the “man made disaster”. Eric Barnes; I have to disagree. I think a bigger factor in our dysfunctional Government is 1) Congress Critters are allowed to homestead and become, as a result, more representative of their big doners vs their constituents (term limits are good) and 2) Congress Critters have made themselves above and/or exempted themselves from the laws they write: e.g. insider trading, Social Security, Obamacare, etc. Do you really believe “no government” is better? How do you think people will behave when there is no one to mail out Social Security checks, no one to pay for the three meals a day kids get at school, no one to pay for roads, no one to mint money? Approximately one-half of this country believes the government is their parent and you want to orphan over 150,000,000 people just like that? Best to rethink that one. If you think it’s a good idea for the USEPA to give money to Red China, you are a Redneck. Still are. There are thousands around the world that could really use cheap, reliable energy. But the push to solar and wind aren’t it, and the CAGW crowd demonize burning of fossil fuels. What’s your easy fix? Wow. It’s true that oxidation of SO2, usually in the presence of a catalyst such as NO2, forms H2SO4, but papers (such as this one: http://www.epa.gov/ttnchie1/conference/ei19/session5/lu.pdf), shows the SO2 levels peaking in 2006, and being on a decline since then. I really would like to know your source for the “sulphuric acid aerosols are trying to eat yours eyes out” statement. Poverty stricken Chinese. Did you see the numbers above? We’re talking about $230,000 to help 100,000 Chinese (works out to about $2.30 per person). How much of a “Scale-up of Biomass Stoves in Western China” will 2.30 get them – a new stovepipe, maybe? If you really think that throwing 230,000 dollars at a country with 5 times the people we have is really going to slow down the rush to CAGW, you’re deluded. But then, you do have the freedom to make totally asinine statements here, knowing full well people will bite and respond. Congratulations. ““…Now coal is cheap of course but in China it brings tears to your eyes. The sulphuric acid aerosols are trying to eat yours eyes out…” – L.T. I’ve been to China many a time spending my time mostly in Shanghai, about the most industrialized and populated area. The air quality could certainly be called less than ideal, but I’ve never witnessed this phenomenon of which you refer. Logically wouldn’t it be the PRC’s responsibility to ameliorate their own air problems at their own cost especially considering that we’re already in debt to them? “How the heck is all this going to stop? Will it require a revolution? It seems that or we all sit back and allow the end of civilization. It saddens me greatly to agree that you nailed it in your third sentence, possibly triggered by an Iranian nuclear device. The “civilized” nations just do not seem to have the resolve to honestly face the ills that trouble the world. I know you are trying to be funny and mimic Jeff Foxworthy, but he would never tell that joke. Jeff knows that a real redneck would get red faced at the thought of the EPA’s idiocy. We’ll hear what real rednecks have to say in November. Hopefully, there are a whole bunch of us out there. Just asking here, what does this post have to do with the numbers acquired and analyzed in regards to the climate? This appears to be more of a political / xenophobic subject matter. I think posts like this one diminish your site and your message. I think that denialist have value in the science (no different then alarmists), however they both diminish their ability to contribute by extremist behavior. I appreciate you will never see this point, as denialists are as blind as alarmist at accepting that they may be so much as 1% wrong on something. It’s a shame. If denialists & alarmists worked as one another’s gate keepers as a team, devils advocates, can you imagine the accuracy of what is being examined and how we could use that information? We truly are a self destructive species, and for the wrong reasons. Cheers. Just asking here, what does this post have to do with the numbers acquired and analyzed in regards to the climate? This appears to be more of a political / xenophobic subject matter. I think posts like this one diminish your site and your message. The overall point has to do with wasted money based on CAGW. Is there a political aspect? Of course. A private company wouldn’t be blowing all this money on windmills and such without govenment subsidies. The green alternatives are not efficient or cost effective. It’s bad enough for us here in the US that we’re wasting money in our own country on CAGW but this post has to do with the US wasting money on broken hockey sticks in other countries as well. On top of that there are Constitutional issues as well. Nothing “xenophobic” about those concerns. So you guys have the debt clock ticking away and you’ve got money to give to…China!? I’m glad I live in Australia where nothing like this is happening…OH WAIT! No, I’m angry because the federal government borrows over 40 cents out of every dollar we spend. You’re thinking is what is driving the world’s money problems. Got a problem? Let the the government (not just the US government but most governments) borrow some money and give it away. That should fix any problem. Need a windmill, borrow some money. Need a solar panel, borrow some money. If we borrow enough money we can fix all the world’s environmental and energy problems. If Boston ( or any other town) has a problem with their lead or their drinking water or their subway or their teacher’s union Boston should fix their problems and get the fed and my tax money out of Boston. The federal grants programs are not my answer to their every problem. Maybe the good people of Boston should redefine their priorities. I didn’t take Boston to raise. That sounds like it would be a fair tax system. The US federal government is up to its ears in DEBT! Give me one good reason we should borrow MORE from the Chinese to turn around and give to the Chinese people. If they have so much money to lend then let THEM foot the frecken bill. They are supposed to be the good little socialist aren’t they? the share of Americans who lived below the official poverty line rose to 15.1 percent, up from 14.3 percent in 2009. That marks the fourth straight year that the rate has climbed. The figure for children was even higher – 22 percent…. In addition, the total would have been higher still by around 3.2 million people, were it not for the existence of unemployment benefits. …Moreover, the share saying they had enough money to buy food for themselves and their family dropped from 81.1 percent to 80.1 percent. Gallup found that in the past 12 months just 6 percent of Chinese said they worried about feeding for themselves or their family, compared to 19 percent of Americans. Looks like the plans to reduce the USA to a third world country are working out just fine. Best Idea I have heard yet but I would go one better. Lets ship all the traitors in the District of Criminals to China and that includes all the bureaucratic lifers and lobbyists. Vote the bums out? Can we not see that our public dialogue is limited to Team A and Team B? Would you like the red or blue kool-aid? ….. A few dollars to China and Brazil is laughably small change–a distraction Does no one remember the greatest theft in history–the corporatist team A and corporatist team B approved bailouts? You forgot the really big one. In 2008 the US Money supply was $831 billion. In 2009 it was $1663 billion. That is up $921 billion in BRAND NEW MONEY hot off the press. It is these losses of the groups that are the last to be reached by the variation in the value of money which ultimately constitute the source of the profits made by the bankers and the groups most closely connected with them. Did you get that? This is the key point. When money is devalued the first pigs to the trough steal the wealth of the late comers. Newly printed fiat money does not create new wealth it just transfers it from the poor, who are always the last to the trough, to the rich. The size of the pie (real wealth) does not change just the number of dollars it is divided by. In other words if you had a savings account or a pension fund they just stole half of it. OH, and speaking of pension funds. How much of your company’s pension money is going into the “Green Industry” and inflating that next big bubble? How much of that wealth is going to be lost when the bubble bursts and the Movers and Shakers and financial fat cats walk away before the bottom drops out. Just asking here, what does this post have to do with the numbers acquired and analyzed in regards to the climate? This appears to be more of a political / xenophobic subject matter. I think posts like this one diminish your site and your message…. It is MY pocket that is being picked. It is MY business that is being regulated. It is MY land that is being rezoned. If you are a brain-washed college kid or apartment dwelling wage slave you might not have noticed yet how much of your life is now spend as a slave to the Regulating Class but I have. 1.9 million dollars! Wow! That almost tops the 700 Billion dollars Saudi Arabia alone makes every day exporting crude oil. Fossil fuel industry does not stand a chance. If you want to follow the money, try going where the money is. 1750 West of Boston, found in family letters, Redneck indicative of station in life. Easily discerned by the sunburn of the neck from stooping while hoe-weeding of the farm plot located outside of the village. Non rednecks were those that were comfortably afforded the hiring of persons to do their hoe work and by all reason had the largest acreage to hoe. Many original Rednecks would in their need for cash, hire-out to do others hoe work. The Non-Redneck’s were dominate in local politics and the association of pursuing, in some abstract way the continuation or rejection of the Coercive Acts-King George3. Some of the non-rednecks became prominent members of the First Continental Congress, that evolved into the Second Continental Congress that in time promoted the concept of Representative Governance. Their names became familiar with that Founding. That Act was in a removed part an allowance of unlimited taxation, like on Boston Tea of the Davison Newman & Co. Ltd. of London, a recepient of special interests from the King . Not so unlike, as written, the 16th Amendment that gave IRS the current arbitrator of just ‘Tax’ collection. Voting Bums out may generate New bums. Power over another person is the greed of all greed. In my view the IRS has perfected the slip-slop of vacuum lift to above the 29.9 Hg. Defying the law of physics that allows foolish spend of Non-revenue. I am from Worcester, 40 miles outside of Boston. It would be “classic” if you were the Chuck Nolan I am thinking of. BTW, you are spot on with your last post. Grant aid to Brazil as they are going to spend huge amounts of money on the Olympics in 4 years’ time and so can’t afford anything else. Grant aid to China to aid 100,000 people. Remind me what the population figure for China is these days? I don’t get the impression that China needs largesse. The Good Ol’ US of A is obviously as daft about politically correct largesse to the ‘needy’ as is the UK (think about aid to India). Never mind our own aging populations being short of proper care, heating and food. On November 6, let’s cut the legs out from underneath the EPA, the Employment Prevention Administration. The bureaucracy is out of control and needs defunding.